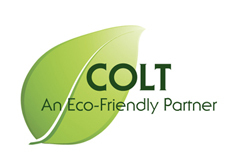 At Colt Print Services we know how important it is to take care of our environment. Below is a list of how we participate in an Eco-Friendly Environment. Recycle all paper used in production. Print on recycled papers when specified by client. Recycle and/or reuse all paper used in the office. Soy base, non-toxic inks are used on presses. Recycled toner cartridges are used throughout the company. All employees have been trained and certified on proper handling and safety processes. All film files have been converted to digital processes. Pressroom chemistry is monitored and replenished with appropriate control systems. Water-miscible pressroom chemicals are used. Plan our deliveries in the most efficient ways possible. All old computers are recycled. All pop cans are recycled.